Emirates is celebrating the Easter holiday with a range of treats available to customers across all classes on board and in the airport lounges from 30th March to 2nd April. Emirates customers travelling from Dubai to destinations in Europe, Australia, New Zealand, USA, Argentina, Brazil and the Philippines will be able to enjoy the Easter offering. Special menus have also been created for the lounges at Dubai International Airport and selected Emirates lounges worldwide. Across all classes, customers can look forward to special buns on board – handmade using Emirates’ signature recipe with spiced dough and orange peel, sultanas and currents. 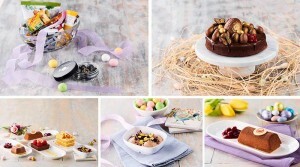 Various Easter-themed desserts will also be served to all customers including white chocolate eggs in Economy Class. First Class customers can also look forward to a special Easter edition of the Lakrids “Egg” Dulce de Leche Liquorice Balls in their personal goodie baskets. The seasonal menus are in addition to the regionally inspired cuisine served on all Emirates flights. On Easter Sunday itself, festivities kick off in the Emirates lounges at Dubai International Airport and in most of the Emirates lounges around the world. Customers in all seven lounges in Dubai will be able to enjoy traditional buns, chocolate hazelnut Easter cake, Easter delight with mango mousse and almond florentine, carrot cake and Easter eggs in a basket. Emirates lounges in other airports will also be serving special menus for the day including lamb gigot in the Emirates Zurich lounge and roasted leg of lamb with mint vinegar in the Emirates lounge in Boston. Those travelling during Easter can enjoy up to 3,500 channels of on demand entertainment on ice, including over 700 movies from around the world. This unmatched variety of content will continue to grow, offering even more choice. New family friendly movies include Paddington 2, Wonder and Justice League and in April, Star Wars: The Last Jedi, The Greatest Showman and Jumanji: Welcome to the Jungle.